The Minister for Business and Knowledge of Catalonia, Jordi Baiget, announced this Thursday morning that in 2016 the Catalan Government has attracted the highest number of foreign investment projects on record. In total 68 projects have been materialized, representing an investment of 352 million euros, the creation of 2,870 jobs and the continuity of a further 1,197 jobs. These investments received the support, assistance and assessment of Catalonia Trade & Investment, the investment attraction area of the Catalan Government. During the press conference, Minister Baiget explained that foreign investment “shows the value of a country’s assets and acts a driving force for the entire economy” while it also “serves to show the level of outside trust in Catalonia and its future outlook”. Furthermore, “it opens up opportunities for the local productive sector”, given that Catalan companies can team up with “foreign firms as commercial, technological and supplier partners”, he outlined. With these results, and comparing with 2015, there is a growth in the number of projects (+17.2%), in mobilised investment (+10.1%), in job creation (+48.5%) and in job maintenance (+0.4%). In fact, 2016 shows a record figure for the sixth year running in terms of project attraction and the second best figure in terms of job creation since Catalonia Trade & Investment was set up in 1985. The Minister stressed that foreign companies who invest in Catalonia value “the strategic location, the entrepreneurial base with quality suppliers, a qualified workforce, its commitment to research, the innovation, the business climate and the quality lifestyle”. All in all, the Catalan Government has identified 7,086 multinational companies operating in Catalonia. 50% of the projects implemented in 2016, through Catalonia Trade & Investment, have a greenfield status, i.e., performed by multinationals with no previous presence in Catalonia. The countries that implemented the most investment projects were the United States and France (with 14.7% of the total, respectively), followed by Germany (13.2%), Japan (11.8%), the United Kingdom (5.9%) and Belgium (5.9%). Analysing the value chain, investments were largely centred on manufacturing industry — with 27.9% of the total foreign investment projects — although the percentage of projects centred on logistics grew from 3.4% in 2015 to 7.4% in 2016. The creation of headquarters represents 10.3% of the projects performed in Catalonia, whilst R&D centres represent 7.4% of the total. In sector terms, most noteworthy are the investments in ICT (25%), the agro-food industry (13.2%) and the automotive industry (13.2%). The main channel for attracting these 68 foreign investment projects has been the network of 39 Catalan Government Trade and Investment Offices around the world, covering 110 markets. Virtually 3 out of every 10 projects attracted to Catalonia were made possible thanks to these offices, clearly demonstrating the importance of this network for the Catalan economy. In fact, for every euro of public money spent the Government has attracted 140.8 euros of foreign investment. At the same time, 110.5 jobs have been created for every full time position in Catalonia Trade & Investment. 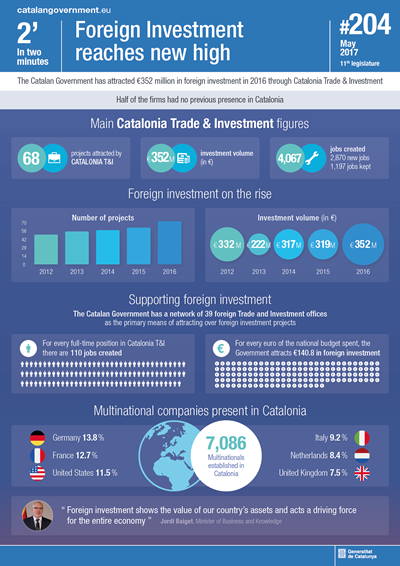 The objective of Catalonia Trade & Investment is to promote and attract productive investment into Catalonia, to help foreign companies take root by attracting activities with greater added value, increasing their supplier base and giving support to reinvestments and expansions. To this end, it acts as a one-stop-shop and unique reference point before the administration, offering tailor-made assistance to companies at all project management stages: from local partner search to staff hiring, up to legal advice and sourcing of premises, terrains and logistics centres, for example. This support is a result of the Catalan Government foreign investment attraction strategy which, through Catalonia Trade & Investment, prioritises investment from the main investment countries (Europe, Japan, United States, China and India); globally relevant companies and leaders in their fields; and those strategic projects acting as a driving force in the entire economy and that are powerful generators of stable, quality employment in Catalonia. That is to say, industrial sector projects, R&D centres, logistics and headquarters, as well as strategic sectors such as electric vehicles (connected and autonomous), industry 4.0 (industrial IoT, 3D printing), mobile technologies and eCommerce, above all. A strategy that is being applied in line with specific programmes, such as the Brexit Action Plan, developed jointly with the Barcelona City Council.